China is generally seen as where devices are made or assembled, rather then where they are designed or invented, certainly in the computer world. In 2001 a Chinese Gov’t funded venture known as ARCA Technologies changed that. 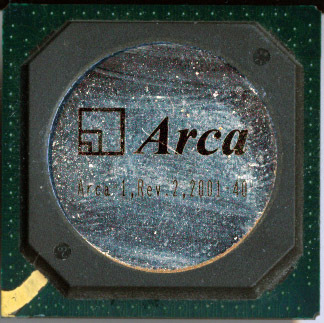 ARCA (Advanced RISC Computer Architecture) designed and released a completely new processor known as the Arca-1. At the time there were two design houses working to create China’s first CPU. Arca, and BLX. BLX made the Godson series of processors which are MIPS32 and MIPS64 implementations. Arca, took a different approach. Not only did they seek to make an indigenous design, but they wanted to do so with their own Instruction Set Architecture (ISA). The ArcaISA is, of course, RISC based, it contains 80 instructions, with each instruction consisting of up to 3 operands, and contains 32 general purpose registers. The original Arca-1 design is made on a 0.25 micron process (by which foundry is unclear, BLX used ST) with a 5-stage pipeline and drawing 1.2W at a clock speed of 166MHz. It contained separate 32 way associative 8K caches for Instruction and Data. The Arca also includes a DSP unit that has a pair of multiply/Accumulate Units (MACs) as well as basic SIMD support for media acceleration (including hardware MPEG2). Not exactly impressive for 2001, but not bad for a first release. However there was more to come.